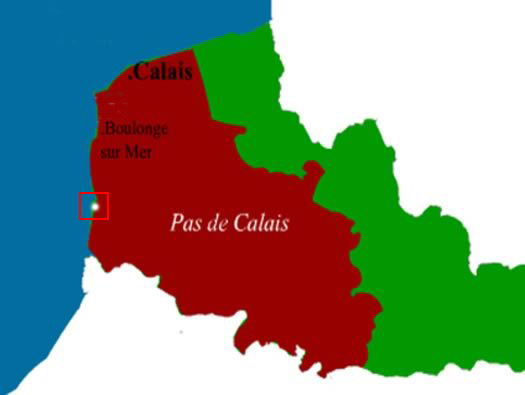 StP Atlantik, Touquet sud, H.K.B, Pas-de-Calais. KVA D1. 8 x R630 machine gun casemate with metal plate. 1 x R105c machine gun casemate. 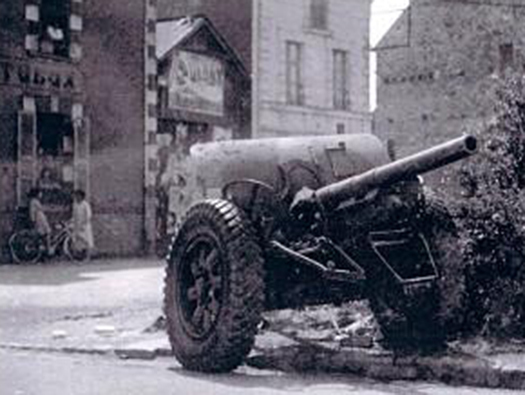 1 x R625 casemate for a 7.5cm Pak40. 1 x R506a casemate for a 4.7cm anti-tank gun (t). 7 x R621 group shelter. 1 x Vf2a group shelter. 1 x 4.7cm Pak K36(t). 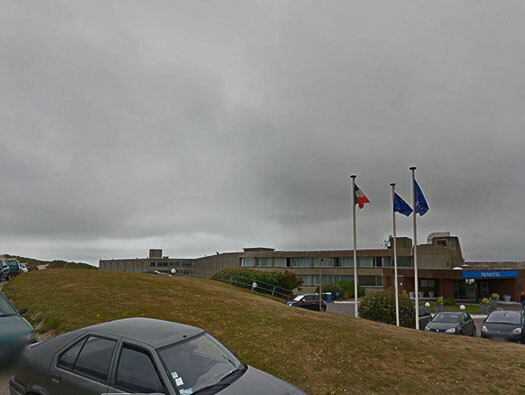 Nova Hotel or the leftovers of the bunkers put together to make an ugly hotel? R198 Wasser bunker for water storage. StP Atlantik with the modern map overlay showing why we cannot find very much of Atlantik left. R119 is a command bunker with an attached fire-control post added and a roof top observation platform..
R119 showing the added shapes to the bunker. Garage for an anti-tank gun. StP Atlantik. Vf7b or an R621? We start at the rear of the bunker --- sorry hotel and there are the remains of either a Vf7b ammunition magazine or an R621 possibly for the crew of one of the open gun platforms. R621 group bunker for the guns crew. StP Atlantik. 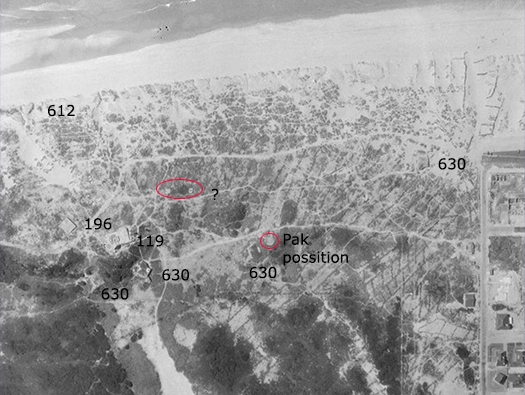 1956 air photo. By 1956 a lot had been removed and more followed very quickly. 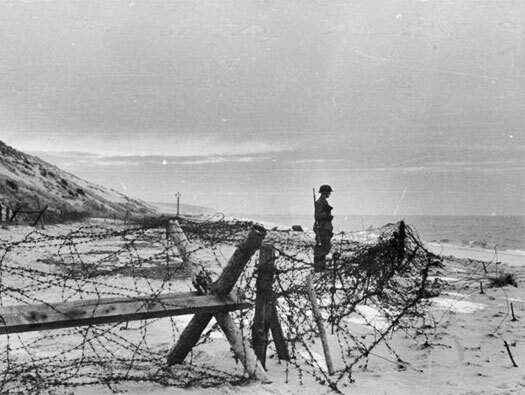 A picture of possibly just here showing a guard and the barbed wire defence. StP Atlantik. R612, a Vf67 with a FT17 tank turret. The Vf bunker has been removed. Vf67 with a FT17 tank turret. The turret taken from a Renault FT17 tank. 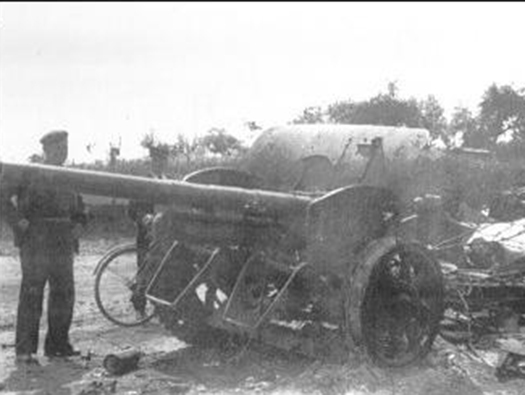 7.5cm F.K.236(b) a gun towed by a lorry with rubber tyre. 7.5cm F.K.236(b) a hippomobile (horse drawn) artillery. Set in the sand dunes firing along the front of StP Atlantik, totally inaccessibly now as the sand covers all the openings. This is a 1940's air photo of this R612 with a flaking wall covering the back entrance. The flanking wall protecting the embrasure from being fired on from the sea. 7.5cm F.K.236(b). F.H. Field Kannon. (b) Belgium. 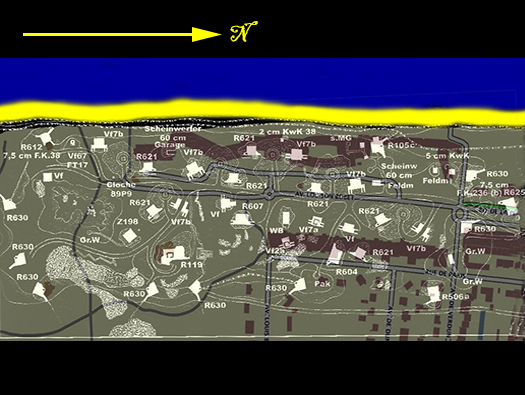 This is the view the gunners would have had up the beach. This gun could hit any landing craft , tank or infantry coming up the beach if a landing had happened here. The view out to sea & the man in the red coat. StP Atlantik. The view south.